Unprepossessing bunch, aren’t they? These lovelies are passuluna¸ olives which have been left to appasssire, i.e. dry and wither on the tree. These are the gangland thugs of the culinary underworld, bruisers you would cross the street to stay clear of. I won’t pretend – who would believe me, for starters? – that these blackened, shrivelled drupes are universally popular. Many Sicilians, however, wax lyrical about them. I’ve always presumed they’re one of those foodstuffs that started out as a necessity, only to become a delicacy. 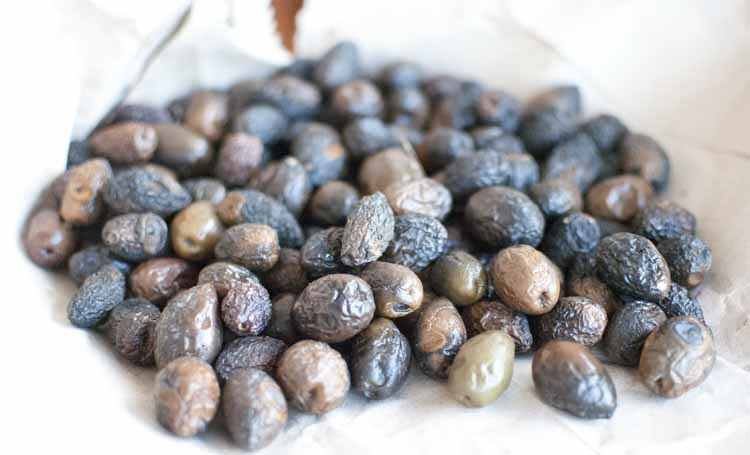 Imagine the situation – we’ve got these bloody horrible, half-rotten olives, that look and taste like they’ve fallen off the tree and begun to decompose in the mud, but we can’t afford to waste them. Any ideas on how to make them edible? The answer is simple enough, and I should know – I’ve asked God knows how many Sicilians for illumination. And, strangely, for a region in which no two people will give you the same instructions on something as simple as how to fry an egg, everyone seems to agree. The procedure is as follows: put them in cold water, bring to the boil and simmer for five minutes. Drain and season. This usually means plenty of salt, oil, and oregano, plus some garlic and chilli to taste, as well as a few good glugs of olive oil. The adventurous could also add fennel seeds. As I said, this general consensus is strange. Not only because when it comes to food, no two Sicilians ever seem to agree about anything, but above all because even when prepared like this, with classic Sicilian flavourings, these miniature gangland thugs taste like, well, miniature gangland thugs, who have had their faces rolled in the mud before (and possibly after) being beaten up. They’re a change from your industrial olives, admittedly. No two are the same, for a start. Some are hard and shrivelled, others brown and soft, half rotten, tasting of dirt. This is a full cross-section of olive society. Every November, which is when you’ll find them on market stalls, I give them another chance, in the hope that there will be that Joycean moment, a gastronomic epiphany, in which everything will become clear, and I will suddenly appreciate the hidden worth of these bitter, miniature prunes. I was beginning to give up hope, but then, this year, for the first time, my fingers came across that perfect olive. Dried, but not too much, yielding, but not too soft, salted to perfection, with just the right hint of garlic and chilli, with that musty, earthy taste that no other olive can aspire to. And then, for a brief, fleeting moment, I saw the light, as I realized, not for the first time, that Sicilians know all too well that life might mean eating dirt, but they’re prepared to do even that, if every now and again they get to taste heaven. By the way, they’re even better if you can resist eating them for a couple of days and leave them to soak up the oil and flavourings. It will multiply the number and intensity of your Joycean moments, so to speak. This entry was posted in Shopping and tagged recipe by hungryenglishman. Bookmark the permalink. As for the “no two Sicilians ever seem to agree about anything” bit, I must quote directly from my old father, who used to call them “mpassuluti”, but I wouldn’t know if it was Messina’s dialect. Where did you get the term “passaluni” from? I wonder if it’s the Western Sicily variant. My grandfather was born in southwestern Sicily in the late 1800s, and he called them passaluna: A in the middle, not U, and A at the end. I never saw it *written*, always just spoken, in his thick Brooklyn-Italian accent, so I can’t really say as to how he felt it was actually spelled. (Well, actually, he called them passalunaS…the Americanized version, I guess… lol) I remember him in the 1960s and ’70s making them himself. Today I found an olive tree near my office, olives starting to dry up and fall off, and decided to see if I could find a recipe, and found this website: mille grazie!